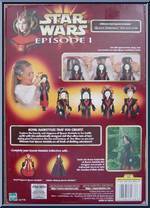 Capture the beauty and elegance of Queen Amidala in her battle outfit with this authentically designed doll that offers lots of hair-styling play! Experience the fun and fantasy of Star Wars as you join Ultimate Hair Queen Amidala on all kinds of thrilling adventures! Contribute pictures, update details or suggest corrections for Queen Amidala (Ultimate Hair). Write a review about Queen Amidala (Ultimate Hair).